THIS RESTAURANT HAS CHANGED LOCATIONS A.O.C. A.O.C. 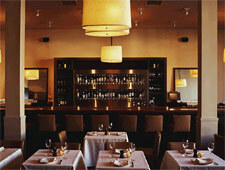 features upscale small-plates dining and an extensive selection of wines by the glass, carafe and bottle. 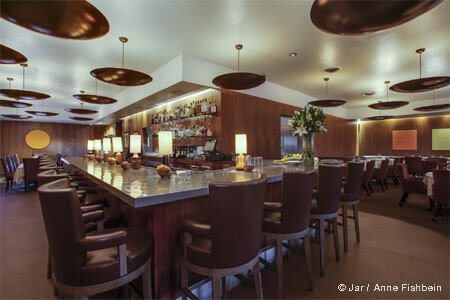 : Bustling, upscale A.O.C. pioneered the small plate concept locally and draws folks looking simply for a glass of Côtes du Rhône and a slice of pâté, as well as those eager for a multi-course feast. A venture of chef Suzanne Goin and partner Caroline Styne, the duo behind Lucques, A.O.C. --- short for Appellation d'Origine Contrôlée --- offers a long wine bar proposing over 50 pours by the glass, a charcuterie bar and table service (for easier conversation and less of a crush, ask for a table on the upstairs patio, which has a retractable roof). The menu is primarily composed of tapas-size portions of French and Mediterranean comfort foods. We like to begin with the bacon-wrapped Parmesan-stuffed dates, baked in the wood-burning oven, followed by lightly tossed salads or seared albacore, then move on to treats like boudin noir, brandade fritters with Meyer lemon aïoli, or pork rillettes with pickled onions (we find the grilled skirt steak a bit chewy). We also enjoy the intriguing selection of vegetables and starches (garlicky cavolo nero, farro and black rice with pine nuts and currants) and the multi-national cheese selection, one of the best in town. The wine list offers many interesting finds from France, Spain and throughout the New World, including some relatively undiscovered California producers.